Turn on the USB debugging mode on the device. Manufacturers of mobile devices can change the Android design on their devices, which means that the menu items may vary. This section shows the Android names without modifications. To find out the version of the Android device, open the Settings application and choose About device. Open the Settings application and and choose About phone. Tap Build number ten times. The main screen of the Settings application will show the For developers option. Return to the main screen of the Settings application and choose For developers. If the Developer options items are locked, set the switch at the top of the screen to ON. Turn on the USB debugging option. Open the Settings application and choose About the device in theOptions tab . Tap Build number ten times. Return to the main screen of the Settings application and choose Developer options in the Options tab. If the options in the Developer options are locked, set the switch at the top of the screen to ON. Open the Settings application and choose About phone → Version information. Tap Internal version number ten times. The main screen of the Settings application will show the For developers option. Open the Settings application and choose About phone → Software version → Advanced. Open the Settings application and choose Mi account. Enter the customer's registration information and click Login. Click the Account registration button, then choose Use alternative. Enter the customer's phone number and tap Next. Enter the captcha and tap Next. An SMS with a verification code will be sent to the phone number you specified at the previous step. Enter the number from the SMS and tap the Verify button. Create a password for the account or tap the Create a strong password button. Write down the password and print it out for the customer later. Open the Settings app and and choose About phone. Tap MIUI version ten times. Return to the main screen of the Settings application. In the System and device group, choose Additional settings → Developer options. If the device is connected to Wi-Fi, disconnect it. To do this, click the notification bar and slide it down, then click the icon. 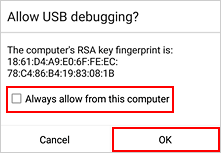 Turn on the USB debugging (Security Settings) option. Turn on the Install via USB option. Open the Security application and choose Software Permissions. Choose Software installation via USB. Turn off Software installation via USB. Open the Settings application and choose Special options → Developer options. Turn off the USB installation monitor option. If the device is not detected, tap theReset button at the bottom of the screen, then repeat steps 5 and 6 again. Open the Settings application and choose Developer options. Open the Settings application and choose Applications → Development. The device must be connected with a cable for data transfer. A device connected with a charger cable is not detected by the program. Start Addappter and connect the device to the computer using the USB cable. Unlock the device if it is locked. The device will request permission for USB debugging. Enable USB debugging and wait for connection. This usually takes 5–10 seconds. Addappter displays information about the connected device. After you connected the device, you can install applications, download books, create a Google account, troubleshoot the device, move data, or perform a reset with data recovery. Disconnect the device from the computer. Make sure that debugging mode is enabled on the device, and then try to connect using another cable and another USB port. Make sure that the device is connected as Media device (MTP). 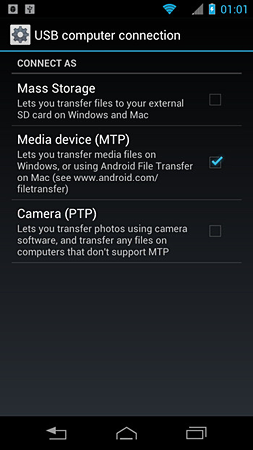 If there is no such option in the list, select the Camera or USB flash drive connection mode. Try to connect the device again. Open the Updates tab and make sure that there aren't any drivers that are downloaded but not installed. You need an internet connection to update the drivers. 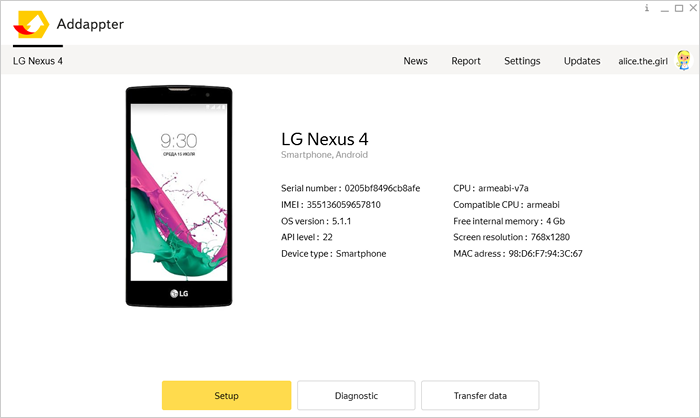 If the device is connected correctly and all updates are installed, but the program doesn't detect the device, contact the support service. Specify the IDs of the device you are trying to connect.